Little Common Football Club pulled off a vital victory in its quest to avoid relegation yesterday (Saturday). 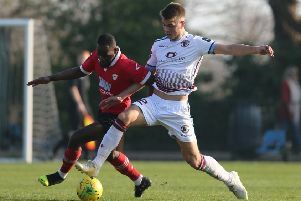 The Commoners triumphed 4-1 at home to Pagham to jump up two places to fourth-from-bottom of the Southern Combination League Premier Division. With the three other teams battling against the drop all losing, Common are now two points above the two relegation spots with three games remaining. Lewis Hole bagged a brace, and Sam Ellis and Jamie Crone got the others for a Common side which opened the scoring after just 34 seconds en route to a decisive 3-0 half time lead. Coming into the game off the back of five straight defeats, Common would hardly have been brimming with confidence. But their spirits would’ve been lifted by Hole rolling a side-foot volley past Pagham goalkeeper Luke Terry after barely half-a-minute. Common had the ball in the net again five minutes later only for the referee to spot an infringement following Russell Eldridge’s corner. At the other end, Callum Overton got to George Bingham’s throughball before outrushing Common goalkeeper Matt Cruttwell and poked it past him, but his shot didn’t have enough pace on it and Lewis Parsons comfortably made it back to clear the danger. Playing with the fairly chilly easterly breeze at their backs, Common doubled their lead in the 16th minute. Cruttwell launched a free kick from inside his own half into the Pagham box and Hole grabbed his second with a neat back header. Ryan Paul headed over from an Eldridge corner before Terry just about clawed away an Eldridge free kick from a crossing position wide on Common’s right. Common went further ahead with a third goal in the 32nd minute. Hole laid the ball off for Ellis to unleash a crisply-struck low drive across Terry and into the far corner of the net from just outside the box. Hole had a chance to complete his hat-trick just a couple of minutes later. Crone did superbly to dispossess Charlie Selby and drive towards the box before playing in Hole, but his touch was heavy and Terry gathered. Hole, in fact, was booked for fouling the goalkeeper. Cruttwell produced a fine save deep into added time at the end of the first half, using his feet to keep out Howard Neighbour’s volley following a free kick to the far post and preserve Common’s three-goal cushion. Pagham had a fair amount of the play at the start of the second period, albeit without troubling Cruttwell, and Common put the game to bed with a fourth goal in the 57th minute. Following Cruttwell’s long free kick downfield, man of the match Hole bravely nodded the ball through for strike partner Crone to beat Terry with a left-footed finish. Pagham pulled one back nine minutes later. Overton was upended by Paul near the byeline following a great run down the away left and picked himself up to convert the resulting penalty, despite Cruttwell getting a hand to the ball low to his left. The majority of the final half-an-hour or so was played in Common territory, but Pagham didn’t fashion another chance of note and Common might have added to their tally on the break. Crone, showing how effective he can be when he’s on his game, drove just off target having been played in by a good pass from Ellis. Zack McEniry, who did well after replacing Hole for his first appearance since recently dual registering for Common with Sidley United, almost scored when a Pagham clearance hit him and rebounded goalwards, forcing Terry into a diving save. In added time at the end of the game, an Eldridge shot from inside the box deflected wide and substitute Dan Ryan’s header from the resulting Eldridge corner was off target. It was Common’s first win since February 26 (1-0 at home to East Preston) and their first victory on a Saturday since way back on October 27 (4-1 away to Arundel). Common: Cruttwell; Weeks, Paul, Parsons, Feakins; Smith, Ward, Eldridge, Ellis; Hole (McEniry 63), Crone (Ryan 77). Subs not used: Tate, Maynard. Southern Combination League Premier Division bottom six (played-points): 15 Langney Wanderers 35-34 (-29 goal difference), 16 Loxwood 35-30 (-28), 17 LITTLE COMMON 35-26 (-35), 18 Arundel 35-24 (-47), 18 Eastbourne United AFC 35-24 (-48), 20 Shoreham 35-21 (-51).